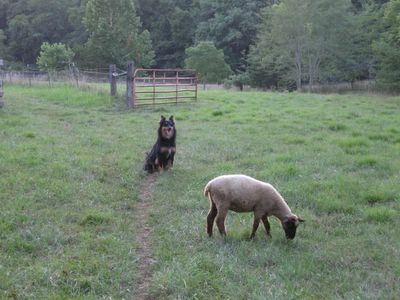 All of the other sheep have been rounded up and are headed for the barn, but Cary has discovered a tasty patch of grass and refuses to budge. The Nanny Bear doesn't mind, though. He patiently keeps his ears to the wind, his eyes on his charge, and that trademark grin on his face. Cary is safe with him on the watch. 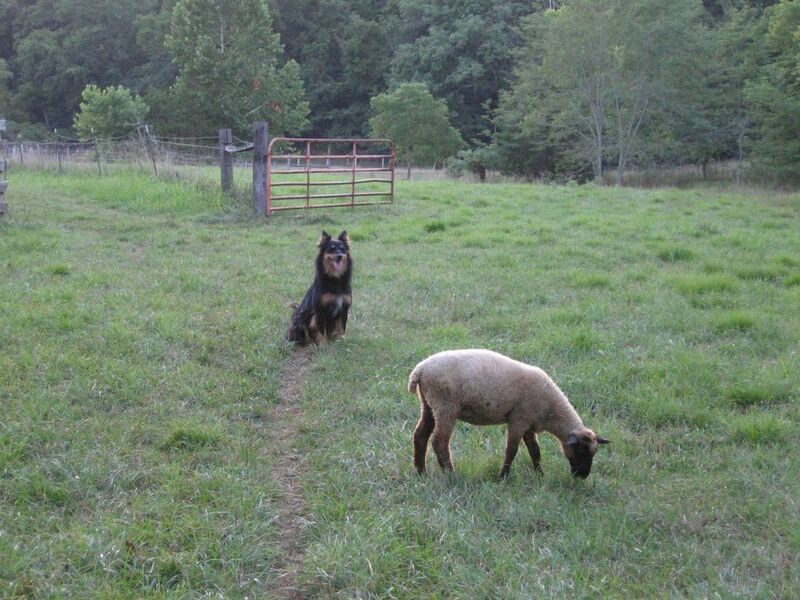 Besides, he knows she'll be done nibbling soon--then they'll catch up to the flock in no time. Lucky Buddy Bear is half English Shepherd and half Australian Shepherd. He loves his sheep! Click here for more about him. Attention Dog Lovers! This is Weekend Dog Blogging #46! To see fun dog photos and discover yummy new food blogs, visit Sweetnicks each Sunday night for the roundup. If you prefer plants to pets, don't miss the always informative Weekend Herb Blogging roundup every Monday. Ok so it looks overly offical. Carey is no longer a baby. I hope that I can live with this fact. You did a good job Mom! I hope it's not over yet! Just because she's the same size as The Nanny Bear doesn't mean she isn't still my baby. Why just this morning she was sitting here by my feet while I was at the computer. I just love The Nanny Bear - he's so devoted and such a good watchdog. I love seeing dogs in their element, instead of cooped up in apartments or being forced to ignore their natural instincts. Which, in this case, are carefully eyeballing a precious lamb. Good job, mama -- all around. when i was a kid i had an australian shepherd.she was the smartest dog i've ever known...and loved to run like the wind. she liked to herd the kittens.